Guardians Of The Past - 1.1 Update - Achievements! You may have noticed the over the last few days the new addition of achievements. There are 12 currently with the possibility of more being added in the future. We think they are suitably challenging but easily accomplished over time. To enable these achievements, we've pushed an update with a couple of minor changes too. Changed the default gadget difficulty to Advanced in online sessions. Added in a new default taskbar icon. Reduced the cooldown of the hammer by 50%. Reduced the damage of the hammer by 25%. As usual, if you have any questions, bugs or suggestions, feel free to let us know on our community hub or in our discord. It's been nearly 8 months since we launched in Early Access, and after numerous updates, we are finally happy to call Guardians Feature Complete. Its been a long and enjoyable road and we couldn't have done it without our early backers. View the release trailer below! As we move onto other projects that are in the pipeline, feel free to continue telling us about any bugs through our discord or in our community hub. 6 different maps with unique hazards. 2 characters with colour customisation. Various settings and customisation for tournaments. Added new map called The Market. 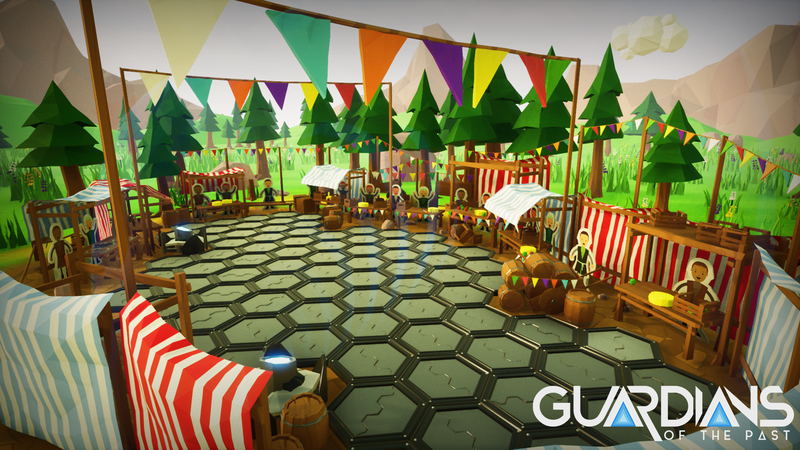 Battle your friends in The Market, as angry merchants and civilians hurl food your way. Added new map called The Docks. 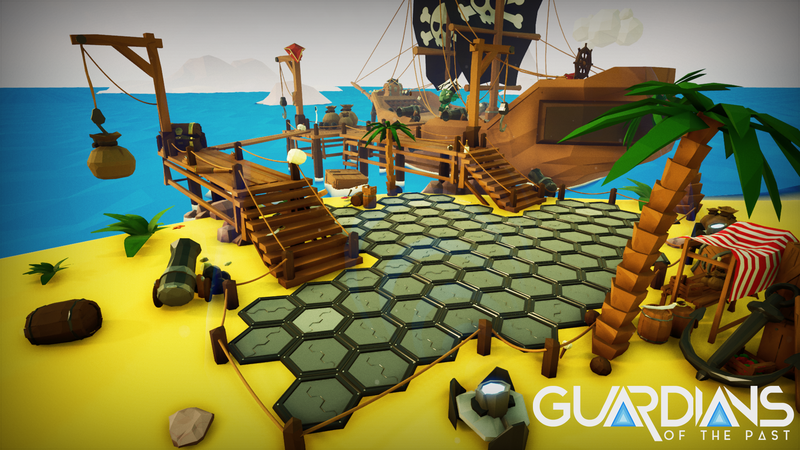 Take the fight to The Dock and use the floating barrels to spring yourself to victory. Added in 2 new game modes - Team Classic and Team Brawl. Added in cinematics to improve transitions between different phases of the game. Added music for each map. Added the ability to change the gadget difficulty in lobbies. Optimised each map to reduce the workload on GPUs, which should vastly improve performance. More optimisation for the network to help reduce lag. Removed the laser indicator from the minigun. Fixed a bug with the hammer which sometimes reset its cooldown if used at the wrong time. Added the ability for mouse and keyboard players to left click to fire in any direction without aiming. Dart trap no longer affects players in the grace period. Fixed selection arrows not correctly hiding when readying up. Fixed a bug in local play which allowed players to edit another players colour. Fixed a bug in local play which stopped Captain Finley from showing up when selected in local play. Improved the Map Select screens navigation and selection. Fixed a bug which caused music to be played when hit by the red jouster. (Not sure how that got in there). Updated the UI to allow for the new team game modes. Massively improved the performance inside the Library. Added Captain Finley's face for use in the necessary UIs. Updated the Map Select screen to allow for the 2 new maps. Added a ready indicator during the multiplayer picking phase. Updated the loading screens to account for the new maps and game modes. Updated the waiting screen to be more consistent with the rest of the UI. Added drop shadows to certain white text to make it easier to see. Added various UI elements for more flavour during the cinematics. Fixed a bug which stopped the UI from being removed at the end of a local play round. Updated the visuals of the lobby screen settings for all players. Added in lots of UI sounds for moving between buttons and menus. Updated the leaderboard screen to work with team modes.